Whether in all SharePoint web applications alerts are not working? SharePoint alerts not working for one site? Alerts not working after restore or Service pack? Alerts not working all the time? or Stopped working Recently? SharePoint alerts not being sent to All the user? or some users? or distribution groups, ad group members? Whether SharePoint alerts not working for document library? list alerts not working? calendar alerts not working ? or everywhere? Only SharePoint daily alerts not working? etc. This will help you to troubleshoot the SharePoint email alerts not working issue, quickly. If its already enabled, try turn off and turn on it back. 2. 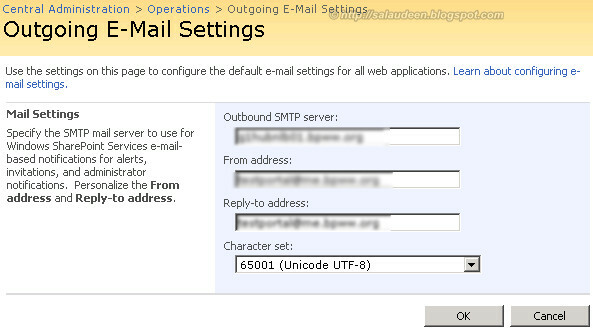 Is your SharePoint Server configured for Out-going E-Mail settings? Go to Central Administration > Operations > Click on Outgoing e-mail settings Link under Topology and Services, Make sure you have valid settings for these fields. Usually you have to provide your Exchange server’s HUB or any valid SMTP server’s address. 3. Is your Exchange server allows SharePoint to Send Mails? In Exchange Server, If anonymous Relay settings is not enabled, then you must add your WFEs in the relay list.? Make sure your ALL Sharepoint WFE’s IPs are added in allowed Relays or Receive connectors in Exchange Server. If you use multiple domains, add all of them. Watch the ‘DROP’ folder in the mailroot of the SMTP server. <Property Exist=”Yes” Value=”every 5 minutes between 0 and 59″/>. If you don’t get this, run the following command to change its value. 6. Whether the user account subscribed for alerts has E-mail account associated? Do stsadm -o execadmsvcjobs. Do restart SharePoint Timer services and IISReset. Is it happening only to a particular user? try remove/re-add em. The initial alert is not security trimmed. Whether the user has access to the list or not, He will receive the initial alert. If the user is not getting alert for any changes, then check whether the user has at-least Read permission on the list/library. If item level permission and Read Access to Only their own items is enabled, Alerts wont work! Is your Site URL’s/AAM entries changed recently? Check the below tables in your content databases, and verify you dont have any old URL in “SiteUrl” column in these tables, if you find, replace them. setting up in the Alternate Access Mappings in Central Admin will correct this issue. 12. Migrated or Changed the Site URLs? Are you migrated from existing versions of SharePoint/ Changed your SharePoint Site URLs? If you conclude alerts are not working for a entire sub-site but works well with another sub-site, then take the export of the sub-site, delete it, restore it again. 14. Is your SharePoint Up-to-Date? Make sure your SharePoint is updated with latest service packs/patches. 15. Want to send SharePoint alert to distribution list? SharePoint alert email to distribution list not working? Make sure your group is E-mail enabled and has at-least read-only permission on the site/list where you are creating alerts. It must be Security group and not distribution list. SharePoint can recognize one users and security groups. So, you can create a Mail for the security group. Same applies, When you send E-mail from SPD Workflow (or any other workflow). Make sure that the group has at least read permission to the site and the group can be viewed by “everyone”. 16. Changes to the user profiles happened wont affect immediately. sync it back. 17. Make sure your timer job account has dbo access to SharePoint content databases. 18. If your Task assignment mails are not delivered, toggle the value for “Send e-mail when ownership is assigned”. Alternates: you can simply design a SharePoint designer workflow to send E-mails. or you can have a event receiver to do the same!